Can a Yank with a "fondness for cigars" and a golf handicap of nine who's been called "the unacceptable face of banking" and "the real-life Gordon Gekko" lead to prosperity "one of the truest English institutions" whose brand value is on par with English tea and Burberry? If you're a Barclays plc shareholder, come April 1, 2011, when the American-born banker Bobby "Blood" Diamond takes over as CEO of the storied English institution, you will be hoping the answer is yes. Diamond, a native son of Massachusetts who'll soon be the king of Barclays, is the subject of a January cover story in , which points out that Diamond's road ahead will not be a smooth one. Barclays' stock has fallen 16 percent in the past six months, and given a drop in investment banking revenue industry-wide, the firm will have to boost non-investment banking revenue in the coming years, or else risk dropping in the banking ranks. Bloomberg also points out that Bob's route to Barclays' biggest office began in unorthodox fashion: through the "back door." 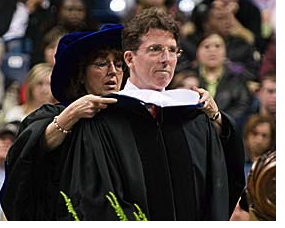 A graduate of Maine's Colby College, Diamond didn't go to Stanford to receive his MBA but to Stamford -- Stamford, Connecticut, that is, where Bob graduated from the University of Connecticut. Afterward, Diamond didn't go to work on Wall Street, or even to a large, prestigious firm such as IBM. Instead, he took a job at United States Surgical Corp., "betting he could gain more experience at a smaller company." The bet paid off, if only because "when his boss at U.S. Surgical left for Morgan Stanley, Diamond followed him to work in the firm's back office and later became an assistant to the chief financial officer. It was a backdoor route to an establishment Wall Street firm." After leaving Morgan Stanley, Diamond endured "four unhappy years at CSFB" before landing at Barclays investment banking unit, Barcalys de Zoete Wedd, which was renamed Barclays Capital in 1997. In 2003, Diamond was passed over for the top spot at Barclays plc for John Varley (who's five years younger than Diamond). In 2008, Diamond famously engineered the purchase of the U.S. operations of the bankrupt Lehman Brothers for a steal of a price and, since, he has successfully led Barclays Capital through a worldwide credit crisis, significantly increasing the unit's global standing in the process.